I have a family of Star Wars fans and my son’s birthday was around the release date of Rogue One. 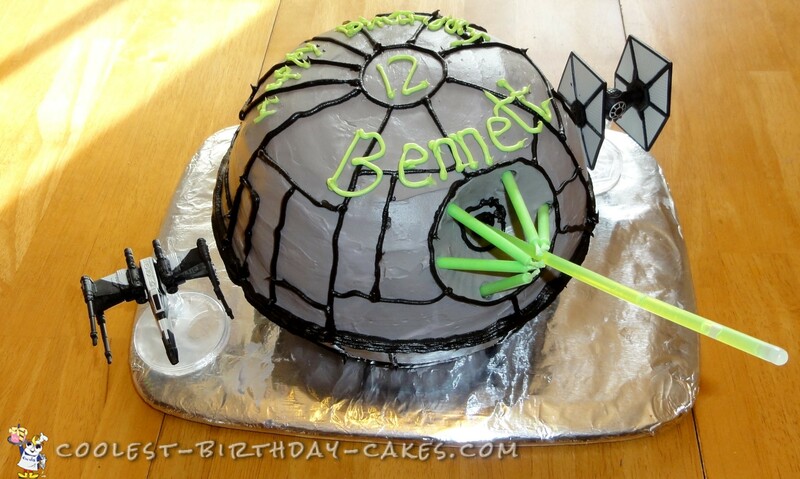 So, a Death Star cake was the perfect choice. I made a light saber cake for him about 5 years ago but this was my first spherical cake and it was easier than I anticipated. I baked a regular layer cake in two mixing bowls, then trimmed them to get a good round shape. The top layer compressed the bottom layer somewhat but that was ok since it needed a flat area to sit nicely. I thought I might need to use toothpicks to secure the layers together, but they stayed with a big dollop of buttercream between them. For the frosting, I used buttercream since my kids don’t like fondant. The challenge with buttercream is always to get is smooth enough. But using a warm spreader and lots of patience we finally got a nice base layer. Then I studied and printed out some internet pictures of various death star designs before finally decided on random black interconnected lines and squares to give the overall effect. The finishing touch came from a glow stick, perfect for the planet killing death ray. When we took out the glow stick and lit the 6 candles, they flamed green and it was really cool! The cake was a huge hit….now that I know I can make a spherical cake, I may try to do BB-8 next!